Culms: Erect or ascending, decumbent at base, hollow to nearly solid, glabrous, sometimes waxy, bluish-green; stolon nodes woolly, nearly glabrous on erect culms. Blades: Scattered along culm, flat, 1.6 to 8 inches long, 1/8 to 1/4 inch wide, firm, bluish-green, mostly glabrous or with few hairs on margins near base, often somewhat waxy; tip tapering to long point; stolon blades shorter, narrower. Sheaths: Shorter than internodes, mostly glabrous or with few hairs near ligule. 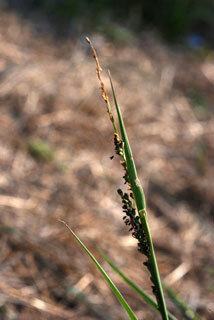 Ligules: Membranous, 1/25 to 1/12 inch long. Inflorescences: Panicle, narrow, spike-like, 2 to 4.8 inches long, about .4 inch wide, included or short-exserted, densely flowered; primary branches erect or strongly ascending, generally not re-branched, .4 to 1.2 inch long. Spikelets: In 2 uneven rows on 1 side of rachis, short-stalked, egg-shaped, 1/8 to 1/6 inch long, about 1/12 inch wide, swollen, glabrous, initially green, later brownish, blunt-tipped; glumes nearly equal, elliptic to egg-shaped, about 3/4 as long as spikelet, 5-9-nerved; sterile lemma nearly equal to second glume, strongly-nerved, tip blunt or rounded. Habitat: Moist, disturbed sites, roadside ditches, prairies, pastures, stream banks; sandy or gravelly soil. Forage Value: Used for forage and sometimes for hay. Quail and doves eat the seeds. Uses: The Chiricahua and Mescalero Apache used the crushed seeds in meat gravy. The stolons were ground, mixed with soapweed, and used as a hair wash. Sometimes used to control soil erosion. Comments: Vine-mesquite is tufted, with long creeping stolons. The stolons are sometimes up to 6 feet long and have swollen, densely hairy nodes.